The world’s largest bonded service center for art auctions, exhibitions and storage will be built in Shanghai’s Pudong New Area by the end of the year. 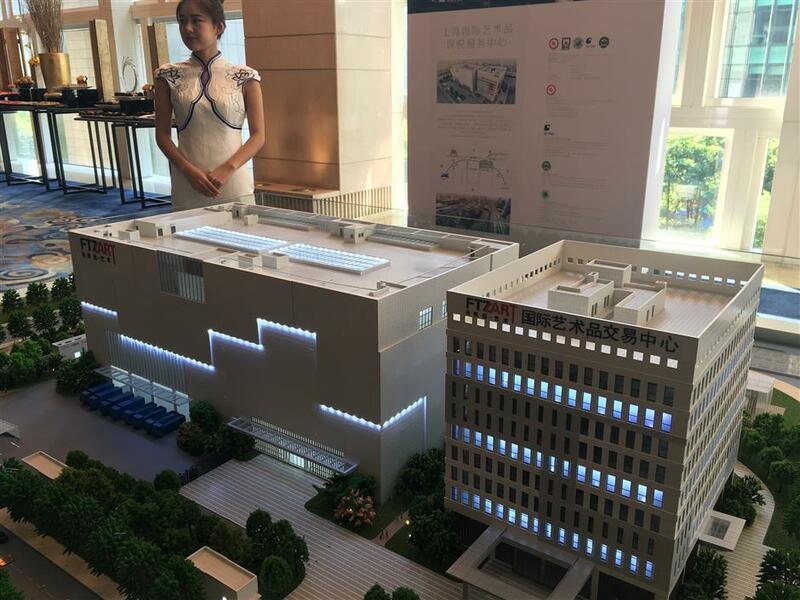 A model of the Shanghai International Artwork Bonded Service Center is displayed at the 4th Chinese Antiques and Artwork Auction International Forum. The world’s largest bonded service center for art auctions, exhibitions and storage will be built in Shanghai’s Pudong New Area by the end of the year, officials told a forum at the weekend. The Shanghai International Artwork Bonded Service Center, covering 68,300 square meters in the free trade zone, will include a bonded warehouse, trade and auction platform, as well as evaluation and insurance services. “The center is expected to become a window and bridge for Chinese culture to be promoted worldwide, as well as drive the development of the city’s culture industry,” said Li Zhaojie, deputy director of the FTZ’s management committee. The center on Zhouhai Road, about a 45-minute drive from Pudong International Airport, will include exhibition halls, artists’ studios and an office building, said Hu Huanzhong, general manager of the FTZ’s International Cultural Investment and Development Co. The first phase of the project, a 3,000-square-meter bonded warehouse, opened in July 2013 and has handled artworks with a total value of over 23 billion yuan (US$3.4 billion), Hu told the 4th Chinese Antiques and Artwork Auction International Forum in Shanghai. Among the speakers at the forum were Li Liusan, deputy curator of the National Museum of China, Deng Huiguo, general manager of the China National Philatelic Corp, and Jean-Pierre Osenat, president of France’s National Union of Auction Houses. The zone also plans to build an artwork appraisal center as well as a copyright operation center by the end of the year to support artwork exchanges and other cultural industries, Hu said. Both will begin operation early next year. The number of cultural companies, such as those in art, print and entertainment, registered in the FTZ has increased from a dozen to over 500 in four years with an annual trade volume of over 30 billion yuan, said Hu. Global artwork sales reached US$45 billion last year and China’s artwork market is ranked third in the world following the US and UK, accounting for 18 percent of global sales, according to a report released at the forum. The blue book on the FTZ’s art and culture industries called for further opening-up to foreign auction houses and lower taxes. Currently, foreign auction houses are not allowed to take part in auctions on paintings and artifacts dating before 1949. The blue book said this had largely limited their development on the Chinese mainland. Chinese artworks have been popular with French collectors since the maritime trades between the two nations in the 18th and 19th centuries, Osenat said. Chinese buyers have also become the main customers at many French auction houses, he added. Osenat said the union and his Chinese counterpart should establish a more effective link to improve exchanges.